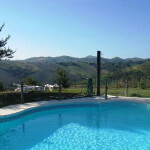 Umbria home and business for sale consisting of large farmhouse now working as an agriturismo with pool, olive grove and fruit orchard standing in 10 hectares (24.7 acres) of land. 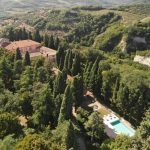 Located a few kilometres from Perugia’s historical centre, on a hilly panoramic position, surrounded by woods and meadows, an ideal location for tourist accommodation. 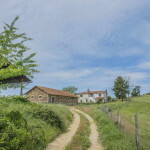 The farmhouse has a surface of 580 square metres and is the result of the careful reconstruction of an old stone house dating back to the early 1900. Currently working as an Agriturismo, the building boasts the typical features of Umbrian rural buildings, with old stone facades, ceilings with wooden beams and terracotta tiles. Ground floor: living room, restaurant with perfectly equipped kitchen, bar, office and toilet. Also on the ground floor is a workshop for cheese making and production. First floor: twelve bedrooms, all equipped with en suite bathroom and independent heating system. Also on the first floor is an apartment, currently used by the owners, composed of: living room, three bedrooms, two bathrooms. The property is completed by a 120 square metre-barn and a 60 square metre-old stone depot. 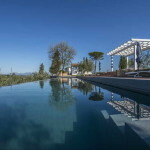 The structure is surrounded by a perfectly maintained garden with pool and gazebo and 10 hectares of land with woodland, olive grove and agricultural land.